Secret sewing is tough stuff, so the reveals are always a bit of a relief for me. I have a few this month and the first was yesterday's Candy Land Play Mat for Louise/I'm Feelin' Crafty's Sew Ready to Play series. There were a few more details about the play mat I wanted to share, just for the record. The background for my playing board is a new favorite, Cotton + Steel's "Paint Dot Cloud" from the Paper Bandana collection by Alexia Abegg. I actually purchased 2 yards at Island Quilter's pop-up shop at the PNW MQG Meetup with the intent of using it for Christmas gift bags, but when I didn't have enough of the Essex I started with, I needed a quick change-up from stash, and the dots seemed my best option. In the end, I'm happy with the switch, the sparkling background adding a nod to Candy Land's very own Queen Frostine. All the colored bits are a mix of stash solids. 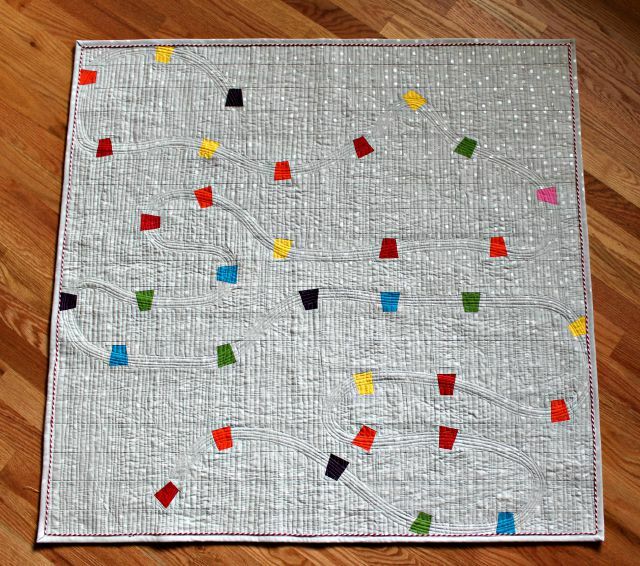 Quilting was the biggest challenge for this project, as the colored tumblers alone didn't scream "Candy Land." But quilting the Candy Land path would, so I marked it on with my hera marker, and matchstick-quilted it with my walking foot. That required quite a bit of rotating of the quilt, but achieved the look I was after. THEN the big question ... how to fill in the rest? For better or worse, free-motion seemed the way to go due to the odd-shaped sections that needed filling, and I considered a lot of options before I settled on a pretty organic straight-line, beginning and ending each row short of the path, so those bits of travel show, but I'm good with that. Fmq is not the method I'm most comfortable with, but it went pretty well, and I like the texture it gave this piece. Washed up now, it's comfy cozy. Backing is a very pink and fun "Welcome Road" a Nicey Jane print from Heather Bailey from 2009 found in the stash. 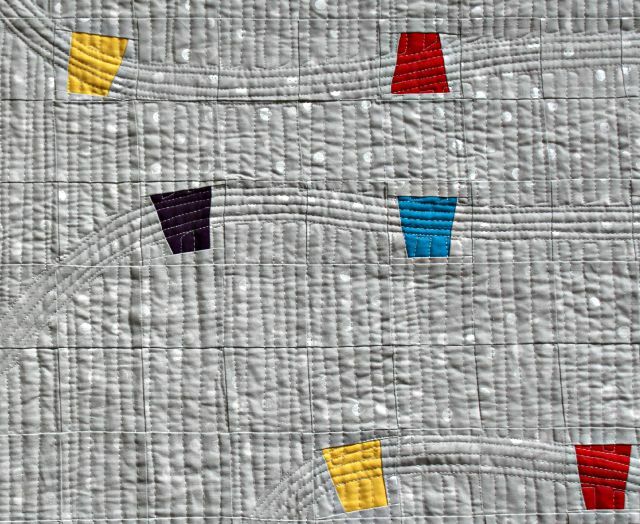 Basically it repeated the vertical lines of the quilting, and I thought grandgirl would approve. She did. As for the binding, daughter-dear suggested incorporating the red and white stripe to match the lettering on the game board, and I did, using the two toned binding tutorial from Ellyn/ellyn's place, using a Timeless Treasures 1/8" stripe paired with more of the dots. I did cut the stripe on the bias to give more of a candy cane effect, and the result was just what I'd hoped for. The finished Candy Land Play Mat measures 40"x38", and there's a tutorial over at I'm Feelin' Crafty. We've already been having fun with this little one . . .
it's awesome, and the bias stripe in the binding is the perfect touch! I love it. Love hearing the details! 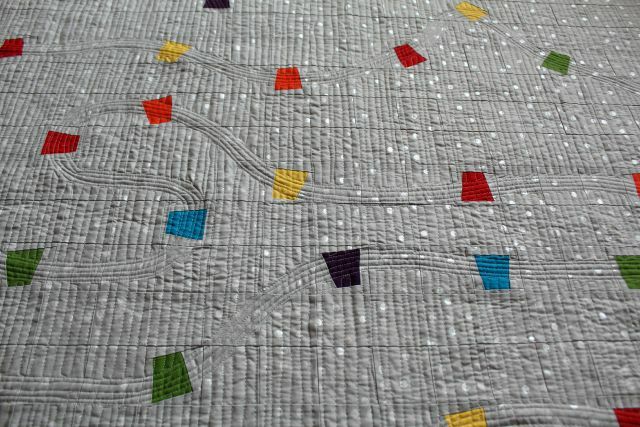 I think the FMQ is fantastic and fits perfectly with the entire quilt! What a sweet touch on the binding! This is adorable! 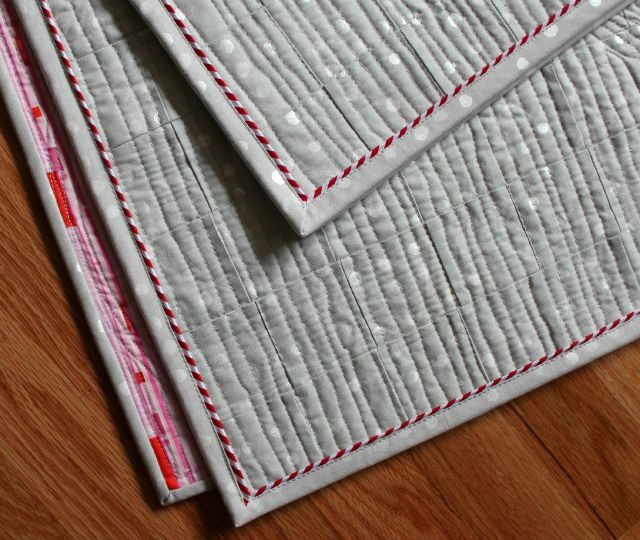 The quilting just makes it...and the binding! This is so fun! The quilting is genius! This turned out beautifully, Debbie! The effect of the stitching is fantastic. What a nice touch on the binding.